“Greenhouse gases contributed a global mean surface warming likely to be between 0.5°C and 1.3°C over the period 1951–2010, with the contributions from other anthropogenic forcings likely to be between –0.6°C and 0.1°C, from natural forcing likely to be between –0.1°C and 0.1°C, and from internal variability likely to be between –0.1°C and 0.1°C. Greenhouse gas concentrations in the atmosphere have only been measured really accurately at Mauna Loa since about 1960, when 310ppm was registered. Before that, scientists rely upon low resolution ice core data which appears to show a very gradual increase from a baseline of about 280-290ppm in 1880. It’s only during the 1950s that atmospheric CO2 concentrations really take off. Note the very rapid 1910 to 1945 warming followed by the sharp cooling to 1950 – all when CO2 was not much above pre-industrial levels and increasing only very gradually. Therefore, we must conclude that natural variability was in charge prior to 1950, certainly with respect to major ups and downs. AGW purists might wish to claim that the general upward trend in temperatures since 1880 is also down to anthropogenic CO2 but then they would have to explain also the longer general upward trend in global temperatures since the end of the LIA, without resort to more plausible natural (solar) influences. In summary, it’s quite likely that the increase in global temperature from 1880 to 1950 can be mainly attributed to natural (internal and external) forcings. But the BBC’s Climate Change by Numbers would have its viewers think otherwise. The so called Monte Carlo method of statistically predicting the most likely future outcome of anything from Formula 1 races to NHS medical policy/practice to CO2 induced climate change is a powerful mathematical tool involving multiple repetition of many different scenarios, Spiegelhalter tells us. I am sure it is – given the right data. The climate model runs cluster around a ‘most likely’ multi-model mean which suggests that we can expect to hit the 2C ‘dangerous’ threshold within the next 30 years or so if we burn all of that remaining 1/2 a trillion tonnes of carbon. What he neglects to mention of course is that the multi-model mean is way ahead of actual observed temperatures and in fact the vast majority of all of the climate models run significantly warmer than reality. Clearly, something is amiss with the models. The Monte Carlo method is faithfully predicting the most likely future outcome, but an outcome probably based upon incorrect assumptions/data about the real climate, about natural oceanic oscillations, cloud feedbacks, water vapour feedbacks, solar variability, and so on. However complex the climate models are, they are mere simplifications of what is actually going on in the coupled ocean-atmosphere system – and it appears that they are simply wrong. The longer the ‘faux pause’ continues, the more wrong they get. Even if the models eventually prove to be right “why should we worry about a rise of two degrees Celsius?” asks Spiegelhalter. Because of weather, extreme weather to be more precise. Climate scientists tell us we can expect more frequent droughts, floods and storms – though the evidence for such thus far is much less than convincing (see Roger Pielke Jr.’s work). But that’s only part of the problem. Environmental engineers use a technique called Extreme Value Theory to allow for the occurrence of really extreme (e.g. once in a thousand years) events which will test their structures to the absolute limit. This relies upon collecting a lot of data about past extreme events, but in a warming world, Spiegelhalter tells us, this data becomes rapidly obsolete and hence the predictions of extreme value theory, which rely upon overall stable conditions, become increasingly unreliable. Hence our ability to plan for such events is reduced, placing society at risk. This sounds all quite reasonable but again, it is reliant upon the unproven hypothesis that patterns of extreme weather events will change/are changing due to global warming, which in fact is also not happening – for the past 15 years or so, global surface temperatures have not increased at anything like the pace that was predicted by the climate scientists’ models; indeed they have not increased by a statistically significant amount at all in any dataset. Climate Change by Numbers? A for effort, C- for attainment. Well, after all the fuss and the feverish anticipation of this BBC program, I thought I had better get round to watching it and I have managed two thirds of the way through so far! I thought initially I might make a few (probably critical) comments on a blog post but, the more I examine this program, the more I feel I need to respond to specific (and some very unspecific) points made within. So let’s start with the grand aim of the program – the goal of convincing us all that climate change (TM) is real via the wonder of mathematics and the analysis of three simple numbers: 0.85C, 95% and 1 trillion tonnes. Each number is assigned to one of three mathematicians (statisticians) – Dr Hannah Fry, Prof Norman Fenton and Prof David Spiegelhalter – respectively. They are “three numbers which represent what we know about the past, present and future of earth’s climate”, Professor Fenton tells us right from the off. Oh dear, not an auspicious start! Hannah Fry (and four-legged friend Molly) tackle the mysteries of measuring global temperature and why 0.85 degrees is so important (or maybe not, as the case may be). 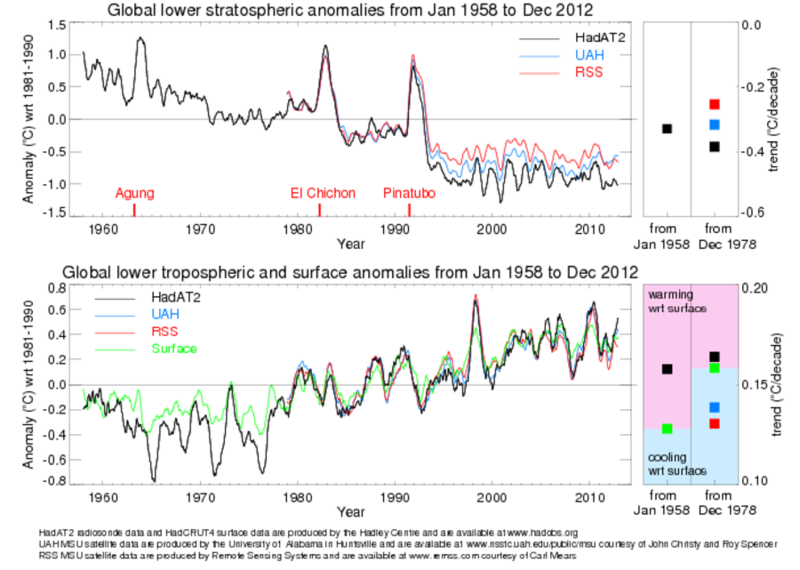 Cue bucket talk – canvas and wooden – then on to an explanation of how errors are teased out of the historic global temperature record, using Kalman filtering. Now this, according to the program, is what enabled men to land on the Moon in 1969 and, under a different title – homogenisation – is what enables climate scientists to ‘clean up’ past temperature data and iron out irregularitiies. All sounds perfectly reasonable. But Hannah Fry tells us that “other people” will “inevitably start accusing” climate scientists of “building bias” into their data, once the raw data is cleaned up in this way and replaced with homogenised data. Those ‘other people’ sound like those nasty sceptics/deniers/contrarians which your mother warned you about. They also sound suspiciously like those conspiracy theorists which Lewandowsky warned us about – you know, the kind of people who will question the unquestionable – the global temperature record, built as it is upon the solid science which gave us the Moon landings. This subtle re-working of the infamous take home message of LOG12 – whether planned or merely coincidental – was not lost on me; but then again we ideational conspiracists often see hidden messages that others fail to detect! Next we get on to data ‘infilling’ (named Kriging, after a South African gold-miner). Then swiftly on to the pause which is not a pause, which does or does not exist, and anyway, which is just one of a number which were always expected to appear to briefly interrupt the general man-made warming trend. No matter that the ‘expectation’ of a 15 year hiatus was just once in every 375 years of model runs (p.8)! But, you know, limited time and all; the program just couldn’t fit the explanation of this mere ‘detail’ into its breathless schedule, even though it tediously slow-burned its way through endless minutes of story-telling build-up to the main points. “Mathematical manipulation of the raw data can look like fiddling the figures”, Fry tells us, and the techniques which climate scientists have used are well understood and “all lead in the same direction”. I’m sure this phrase was an unfortunate choice, but yes, I think that’s one of the main contentions of some sceptics – the fact that, in general, these adjustments do all lead in the same direction, i.e. more warming! Summing up then, Hannah concludes that, even with all the uncertainties in the past temperature record, the scientific consensus is that the earth’s temperature has risen by 0.85C since 1880. This is fairly uncontroversial, even amongst climate change sceptics, who generally acknowledge that the planet has indeed warmed overall (but certainly not uniformly, either spatially or temporally), since the 19th century and indeed since the Little Ice Age ended. 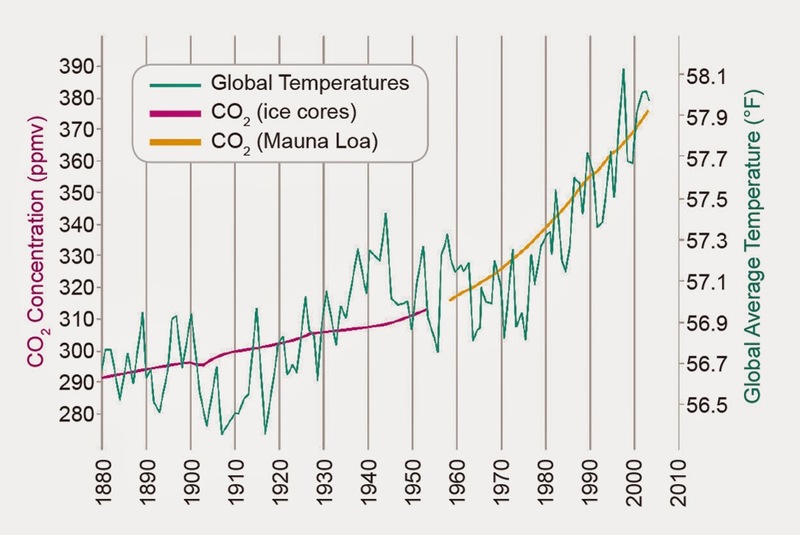 The controversial part, as Hannah points out, is how much we are responsible for that warming, which naturally leads onto the second guest presenter, Prof Norman Fenton. He will tell us how the IPCC are 95% certain that we are responsible for virtually all of the warming, but it’s not ‘this’ warming (0.85C), it’s the warming that has taken place since 1950. So why bang on about the ‘almost a degree’ warming since 1880 when it does not relate directly to the second crucial figure? Why not bang on about the ‘slightly more than half a degree’ warming since 1950 which the IPCC tells us is all down to CO2? I’ll leave the reader to speculate on that. 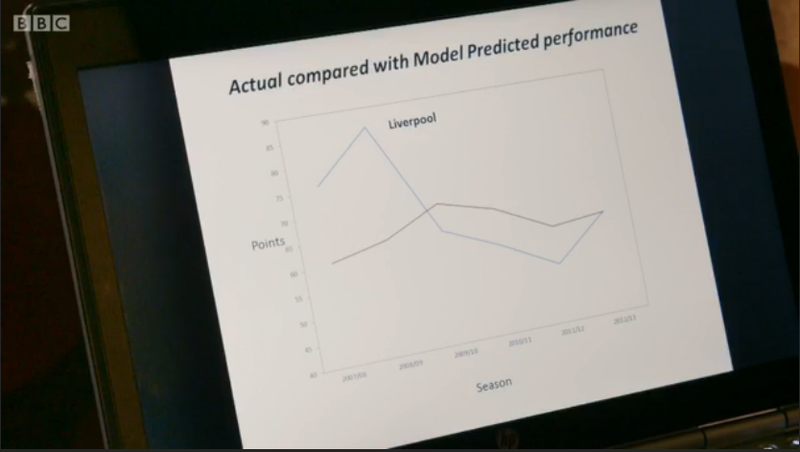 Hmmm, not quite so impressive, but unabashed, Prof Fenton says that this good model fit is “true for all of the teams in the Premier League”. He goes on: “Now I know I can trust my model, we can move on to the clever bit”. He really does seem to have this IPCC attribution study nailed! The “clever bit” is isolating what factor, if any, has a dominant effect upon any team’s performance, which turns out to be the wage bill. This is ‘attribution’ and the principle is the same for climate change, albeit the latter situation is far more complex, with an extremely complicated web of interacting variables needing to be taken into account rather than just a few. Most of these variables are related to natural (internally and externally forced) climate variability but, nevertheless, the IPCC has looked at them all and concluded that their net effect is near zero since 1950 – hence they can attribute to CO2 emissions with startling 95% certainty virtually all global warming since 1950 (but not since 1880). How, you may ask? Well, firstly because of depressed Swedish physicist Svante Arrhenius. He it was who, in a roundabout sort of way, first showed, “using maths”, that a doubling of CO2 could warm the globe by 4C via the so called Greenhouse Effect. So that’s one crucial piece of ‘evidence’ in place; now just to ‘prove’ the assertion that natural variability has played virtually no part in recent global warming. 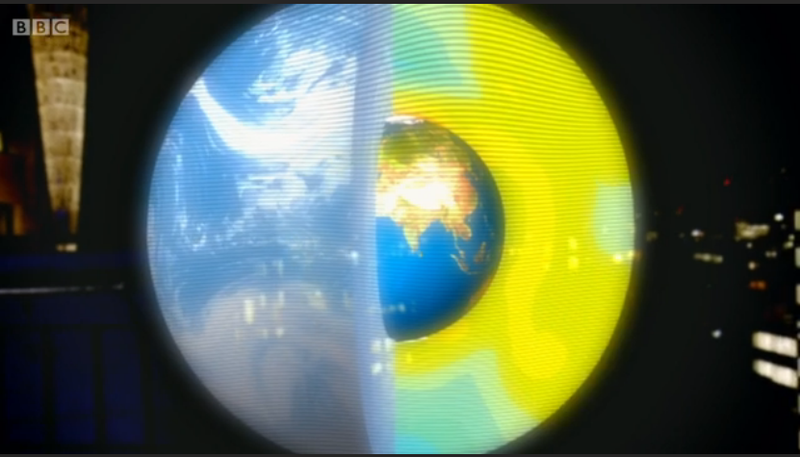 What this shows is accelerated warming of the troposphere and cooling of the stratosphere. The stratosphere has indeed cooled since the 1960s – though this cooling trend has halted since the mid to late 1990s. The tropical mid-tropospheric ‘hotspot’ which we clearly see in his ‘actually happening’ representation above has actually failed to materialise, even though it is one of the key predictions of the climate models. There has been no observed accelerated warming of the mid troposphere over the tropics. So even though the troposphere as a whole has warmed and the stratosphere cooled, the mid troposphere has not warmed significantly compared to the surface. There is an alternative (anthropogenic) explanation for stratospheric cooling and surface/tropospheric warming which involves CFCs. 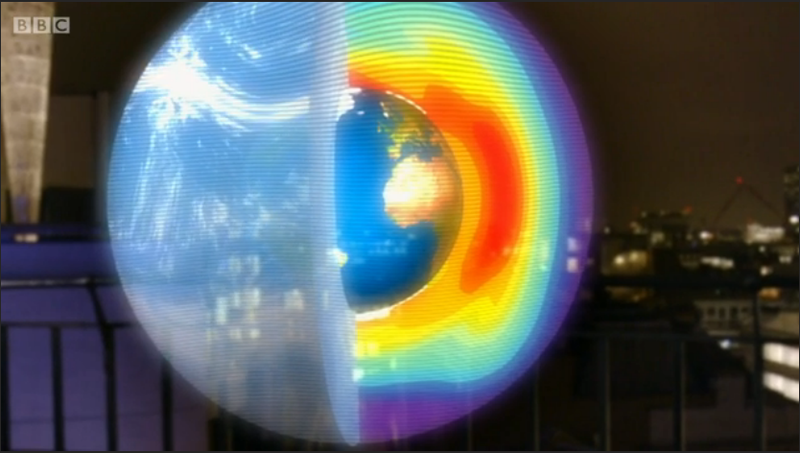 Basically, the hypothesis is that accelerated ozone loss caused by CFCs in the stratosphere has resulted in cooling of that portion of the atmosphere whilst, at the same time, UV energy which would normally be absorbed by stratospheric ozone (warming the stratosphere) has passed straight through to warm the lower troposphere. This might explain the ‘pause’ in global warming from about 1998 and the corresponding ‘pause’ in stratospheric cooling as a direct result of the decline in the concentration of ozone depleting CFCs in the upper atmosphere since the international adoption of the Montreal Protocol in January 1989. 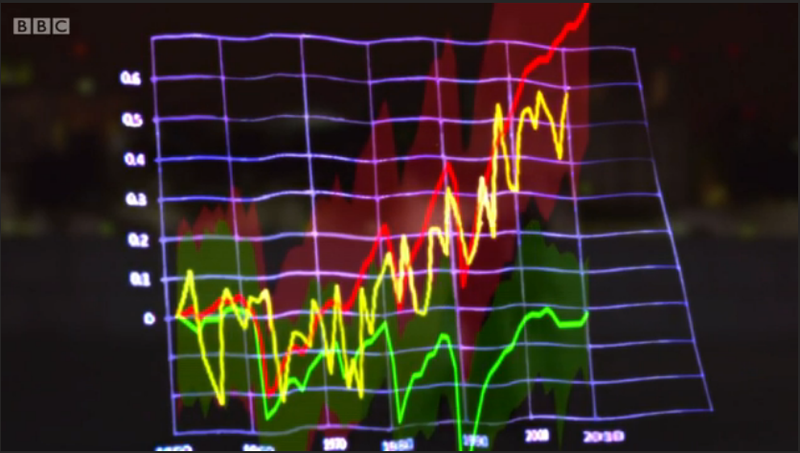 Alas, once again the tight programming schedule does not allow Fenton to explain to his viewers about the assumptions inherent within this graphic, namely a high-end climate sensitivity to CO2 (increasingly looking doubtful), negligible solar influence and internal variability which has had nearly zero net effect since about 1950. Those assumptions are challengeable. Fenton says that the AGW fingerprint in global warming is as clear as the wage bill in his Premier league performance model; in fact so clear that the IPCC assigned 99% certainty to it. It would seem that the poor dears were so embarrassed by the devastating clarity and certainty of their science that they downgraded their figure to merely ‘greater than 95%’ just in case there were any hidden errors for which they had not accounted! Now ain’t that humility and honesty! Professor Norman Fenton appears to have had a bit of a rethink with regard to his presentation in the program. In his blog post he comes across as much more guarded about the role of humans in climate change than as portrayed in the program. Well worth reading. Bob Tisdale explains how Steinman, Mann and Miller have reconstructed ‘natural’ internal oceanic oscillations using CMIP5 models as the basis! UPDATE: I’ve changed the title. This better represents the post.